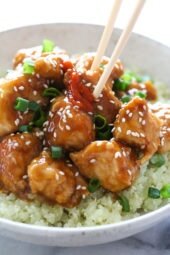 This lighter General Tso’s Chicken is made with chunks of white meat chicken breast, lightly wok sautéed with an easy, healthier stir-fry sauce, and more than half the calories than if you ordered take-out! General Tso’s chicken is a sweet, deep-fried chicken dish that is served in North American Chinese restaurants. This healthier lightened up version is wok sautéed instead of deep fried, and made without all the added sugar used in most restaurants. Guys, I love making Chinese food at home because I have more control of what’s going into it. I’ve done so many take-out makeovers like Orange Chicken, Pepper Steak, and Cauliflower Fried Rice, so it’s hard to believe I haven’t posted a General Tso’s yet! A plate of take-out General Tso’s chicken is usually made with deep fried chicken thighs and lots of sugar. A plate can easily set you back over 1000 calories! Swapping dark meat for white meat, lightly wok sauteeing in place of deep frying, and cutting out the extra sugar since hoisin is sweet enough worked out great. Finally, I served this over cauliflower rice, but brown rice would also work. If you like a sweeter sauce, you can add 1 tablespoon sugar in the sauce. To make this hot, add 6 whole dried red chilies while stir frying the chicken. Add a little orange zest to brighten the dish up. If you make it, I would love to hear what you think! Please come back and leave a comment, or share and tag me! For more Chicken Recipes click here! In a medium bowl, combine the chicken, 2 tablespoons soy sauce, 3 tablespoons cornstarch and egg white. Toss to combine and set aside while you chop the vegetables. Mince the garlic and ginger and chop the scallions. Separate the scallion whites from the greens and set aside greens for garnish. Heat a small sauce pot over medium heat. Add 1 teaspoon of sesame oil, ginger, garlic and scallion whites. Sauté for 1 minute. Add the chicken broth, remaining 2 tablespoons soy sauce, sriracha, and hoisin and whisk to combine. Add the remaining 1 tablespoon cornstarch and whisk sauce until starting to thicken, about 2 minutes. Once thickened, turn heat to low and keep warm while you make the chicken. Heat a large wok or non-stick skillet over high heat. Add 1/2 tablespoon of sesame oil then half of the chicken pieces. Cook chicken for 3-4 minutes, or until browned on the edges. Flip chicken and cook an additional 2-3 minutes, or until cooked through. Set aside on a plate and add the remaining oil and chicken as directed. 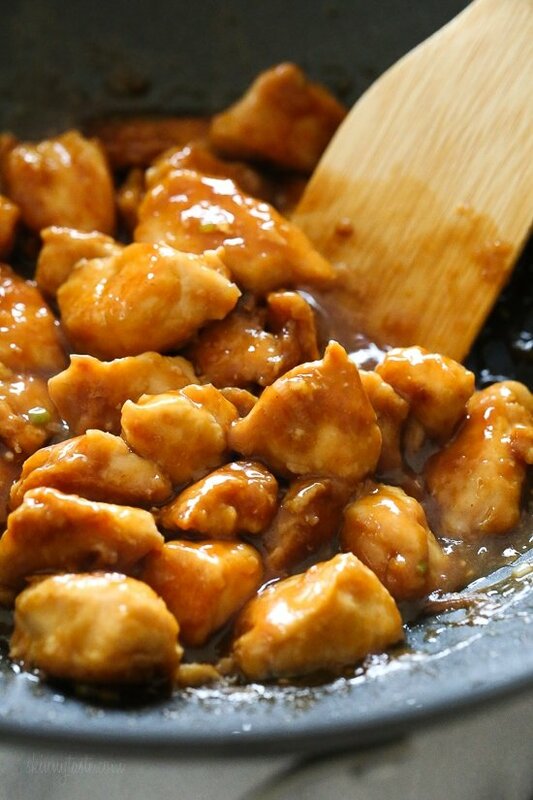 Return the chicken back to the skillet or wok, add the sauce to the skillet and toss to coat. Sprinkle with scallion greens and sesame seeds. Serve immediately with extra sriracha, if desired.